PHUKET: Following Wednesday’s earthquake felt across much of the country, unusually high tides yesterday created fear of another tsunami among some residents of west coast beaches. Authorities said the waves, which damaged a number of seaside restaurants in Thalang District, were unrelated to seismic activity and were just the result of normal tidal conditions and strong monsoon winds. The waves damaged nine restaurants along Haad Saikaew in Tah Chat Chai, just south of the Sarasin Bridge along Thepkrasattri Rd. Tides there reached their highest at around 9 am, when they overturned tables and chairs and washed away the concrete foundations of the restaurants, constructed of bamboo and corrugated zinc. No injuries were reported. Pointing to a pillar put in place to mark wave heights during the December 2004 tsunami disaster, locals estimated that the waves reached a maximum height of almost four meters at the restaurants. 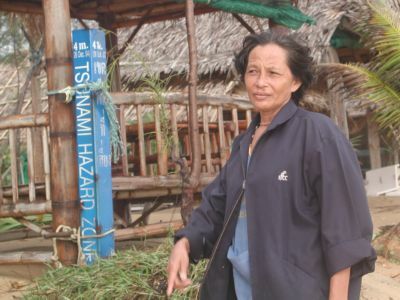 Chanthira Kalmachshima, owner of Andaman Seafood, estimated the damage to her restaurant at about 10,000 baht. “It wasn’t like a tsunami because the sea didn’t recede first. They just came up like regular waves, but much larger than normal. About nine restaurants were open at the time and all were badly damaged. We will have to find a safe place to stay tonight,” she added. About 50 vehicles were still parked on Sarasin Bridge at 8 pm with people monitoring sea levels there. K. Chanthira noted that a few days before a large sea turtle washed up on the beach and died. “We felt that this was a sign that there was something wrong with nature. Then today these huge waves came, the biggest we have seen since the tsunami,” she said. During a meeting at the Governor’s office this morning, an official from Mai Khao Tambon Administration Organization warned that even higher tides are expected for tomorrow and there was a possibility that sections of Thepkrasattri Rd could become inundated. The official said he thought the unusually high tides could be a result of global warming. In Phang Nga, some villagers in the Baan Namkem area of Khao Lak evacuated their homes yesterday to seek shelter on higher ground in fear of tidal waves, the state-run Thai News Agency reported. The area was devastated in the 2004 tsunami disaster. Phang Nga Tourism Association President Chittiporn Suthipibul, also a member of the Khao Lak Resort management team, told the Gazette at about 1:30 pm today that seawater was flooding the ground floor of her hotel and several other resorts in the area. Similar flooding occurred at about 9 am yesterday, she added.